:: Life Uncommon :: Logged onto MSN via Mini this morning and was… - Dreams are what you wake up from. Logged onto MSN via Mini this morning and was amazed to find nobody online. We then started to talk about the Id and the Superego. Yeah, Id and Superego at eight in the morning. It drifted to Madonna to London to Long Term Distance Relationships to Lonely Tokyo to Ugly Strippers to Both Sides Now and eventually to Jewel. iamcrest recalls "Hands" and "Foolish Games". Her poignant lyrics simply tear away the layers to reveal the innermost. This is me down on my knees"
Another lesser known song, which possess the same 'tearing' effect must be "Life Uncommon". i think jewel's vocals add power to her songs for the 'tearing' effect. btw karen the lawyer's talking about you last evening. i think she misses you. What's ur definition of being " Uncommon "? Hey dude, great chatting with you! Thanks for introducing the song, it was coincidental that it was brought up. I’ve appropriated it to reflect on a protest I’ve witness yesterday at Parliament Square on my way to Chinatown. Here are some pics I've taken to share with you. Apparently, it was a protest against the British government who wants to end the right to protest and the freedom of speech in Parliament Square (opposite the Houses of Parliament, Big Ben) by rushing through a Serious Organised Crime and Police Bill. Under the Bill, protesters may face arrest for “spoiling the view” and can be jailed if the demonstration is judged “illegal”. Anti-war protest is their first target and a certain Mr Brian Haw’s extraordinary peace campaign is under threat. 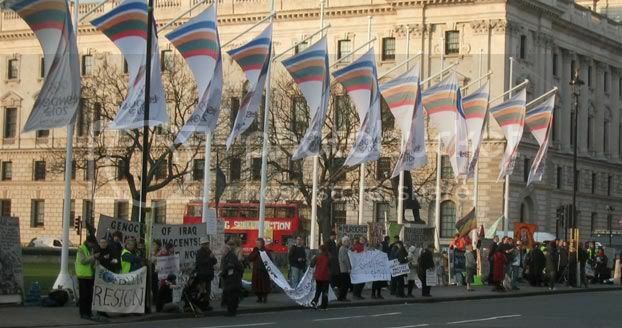 Brian Haw has been protesting against UK and US government policy towards Iraq since 2 June 2001 and has camped out in Parliament Square with his peace placards for three and a half years, 24 hours a day, in all weathers, despite the government’s frequent attempts to remove him. U've mentioned the mini. MAC mini? Cool. How's it? Worth getting? erm, the XDA O2 Mini. Ooops. Sorry. Didn't go that far back in ur blog. Chanced upon it from my frens' frens' page. =) Now i know.